I officially have two preschoolers in my house. Our little ladybug started school with everyone else two weeks ago! From her 6th day of life outside the womb, she has accompanied me to drop off and pick up her brother. Sometime back in fall, she began to cry to stay at school too. She was so ready to be there and had absolutely no fear. Right before Christmas we started talking it up quite a bit and visited her new classroom the last school day before Christmas. 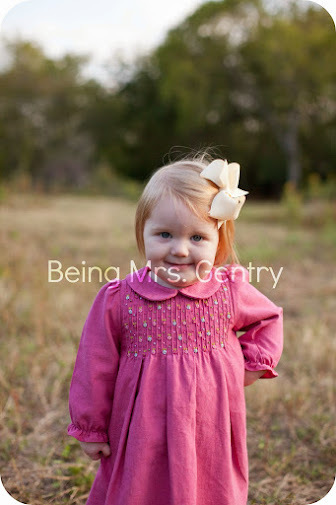 She knew her teachers' names, and she was ready. When I came home with her school gear, she insisted on carrying around her "pink packpack." 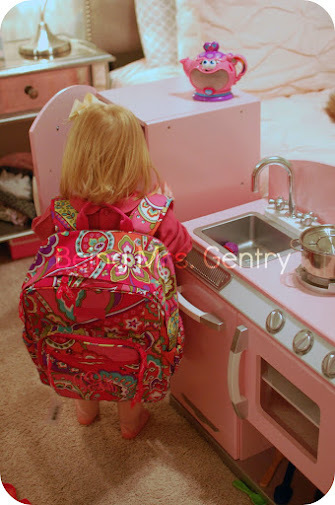 Playing in her pink kitchen with her "pink packpack"
On her first day, she demanded to carry it in herself, just like her brother does. It was way too heavy, and immediately she fell backwards. But she still insisted! So I carried it by the handle at the neck with the straps over her shoulders. When she got to her classroom, she stood at the door until they let her in. I had asked her to come with me to Jack's room first (right around the corner), but no. She didn't cry or fuss about it--she just stood and looked at her teachers like "isn't this where I'm supposed to be?" After I signed her in, she walked right through the door, and that was that. I love her confidence. Needless to say, she's having a great time. She told us all about it on her way home and even named her friends she played with. She's even sleeping on her nap mat like a champ. I can already tell she's learning and becoming even more social than she already was. She's growing up so fast! I'm sitting on the opposite end of the couch from an almost two-year-old, strawberry blonde who kept me up most of the night last night. She ran fever, and as much as she's fever free now, she still doesn't feel good. I can tell because she's actually sitting still. She's propped up on a pillow with her favorite blanket and baby watching "Let It Go" i.e. Frozen. That is definitely her hand on her hip. As I crawled into her eventual big girl bed last night around 12:45 and tucked her in beside me, I ran through our schedule for today, noting who I needed to call, and what would need to change about the day. There are many benefits to being home with my kids during this season, but as a former working mom, this is the biggest burden that has been lifted. I can stay home with my little sick ones without my work obligations hanging over my head. The war between being present for my sick child, yet keeping my responsibilities at work on track was enormous. I didn't give myself any grace from my own high performance expectations. All that to say: I don't take for granted one second that I'm here with this little lady without much more than a text to my Tuesday morning Bible study group to say I won't make it. Wherever you are today in your journey of motherhood, I pray on this Tuesday you find much grace and peace from the Great Giver, our Lord Jesus. He is everything. 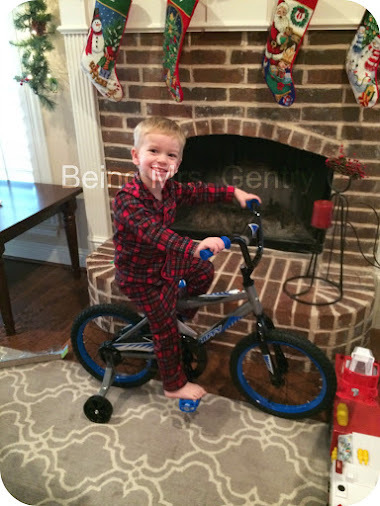 This was the year of our little man's first bicycle (with helmet) and our little lady's pink kitchen. 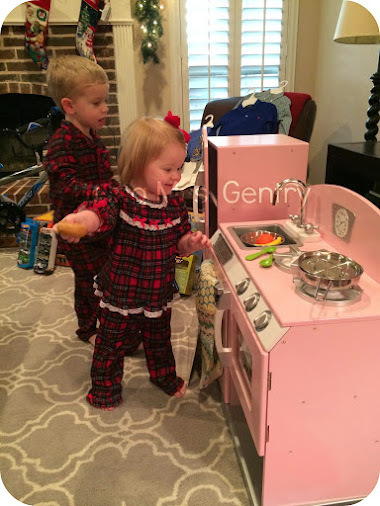 We've had mostly windy, nasty, or way too cold weather since Christmas Day, so we can't wait until it clears up for some outdoor riding days, but until then, we'd love to high five Santa for the kitchen because it has proven to keep both kids busy for a long time. Like everyone else, we had a full December. And the time I would normally spend blogging about it went to watching the Gilmore Girls while the kids napped. True confession right there. Per my 4th year of parenting MO, I waited longer than I could have to take the kids to see Santa. 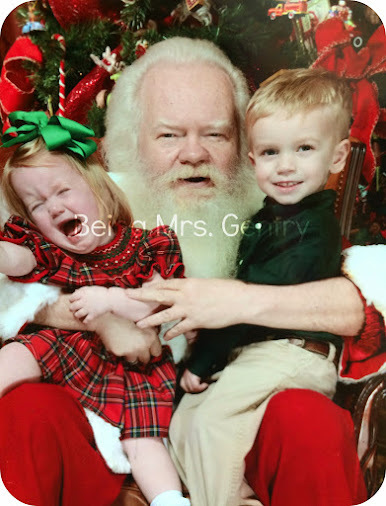 I wrote a little about that here, but below I've included what I think is my favorite Santa picture of all time. 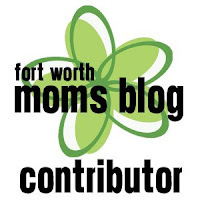 If you've never taken the kids to see the NorthPark Center Santa, in 2012 I gave more details about the process of getting a number and standing in line. It hasn't changed since then. Could they be having more opposite experiences? 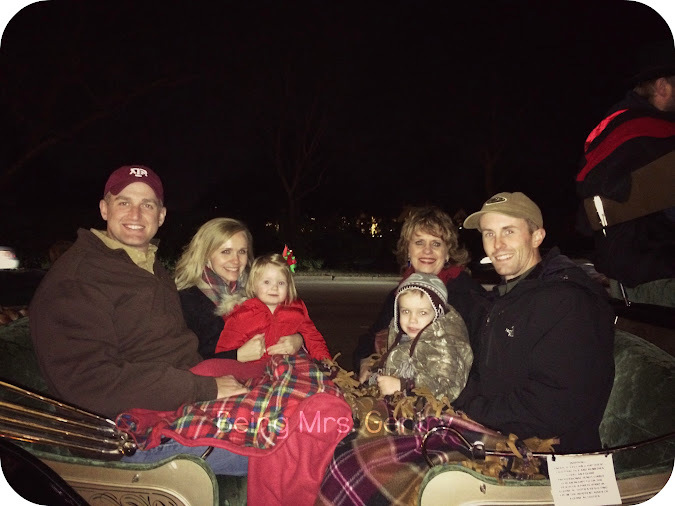 My parents took us on a carriage ride through the Christmas lights out of Highland Park Village. It's really magical. My dad had to go out of town for work unexpectedly after our reservation was made, so that's why he's not there. Here was our experience last year. We had supper at Mi Cocina and bundled up under the blankets for almost an hour ride. 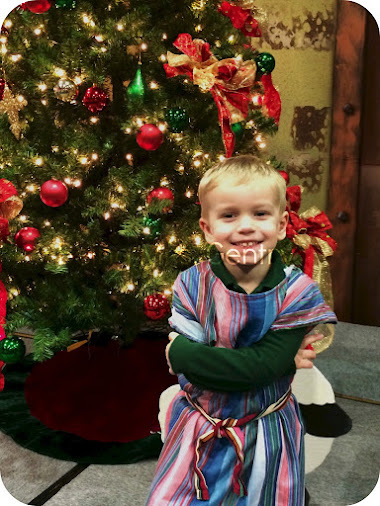 Jack was a shepherd in his school Christmas program. He sang and tried not to smile for my pictures the entire time. 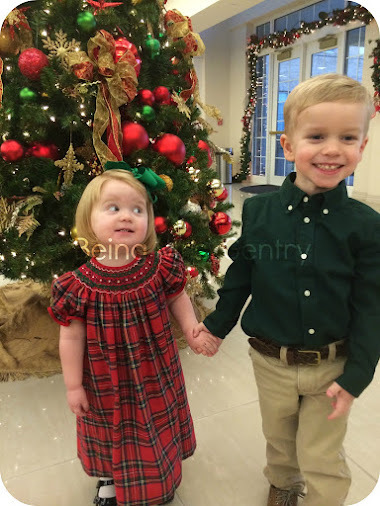 This last pic was taken on Christmas Eve in our church Welcome Center before I had to carry Annabelle out of the service after screaming during O Holy Night, then again during the next soloist. This was also before we let Jack blow out the candle, which he did so well that he also sent all the melted wax flying onto his and Brad's pants and shoes. As I was googling "how do I get wax out of clothes" on the way home Christmas eve, I laughed it off/consoled myself thinking that this is probably the biggest night of the year for those search terms. Well, 2015 is here. I've been so busy procrastinating finally getting the last bits of Christmas down in my house that I've kept from blogging too. As I speak, there are still at least two Santas up and one fabulous garland of holly still adorns the mantel. But my favorite ornaments are carefully wrapped in tissue paper and tucked away, and the tree is down, so at least there's that. Above is the last picture we took in 2015, after eating IHOP at 5:30 PM with friends that we spent the past I can't remember how many NYEs with. We'd just gotten back from a trip sans kids, so it didn't seem right to spend another night away from them. It was low key, but that was great too after a too busy Christmas season. I've made some mental notes of how I can keep the too busy-ness from happening next year. We'll see if I put them into practice. I'll be posting a few catch up posts from over Christmas because I love to look back each year and see how my kids have changed, and it's easy with them consolidated right in this space. 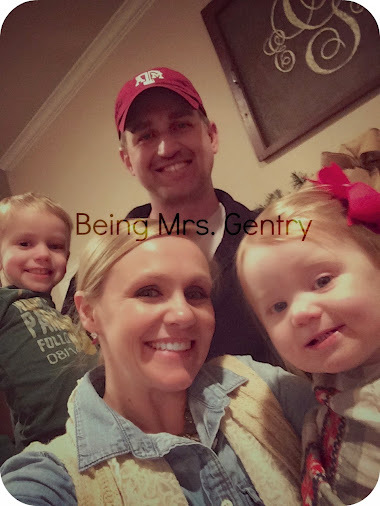 As for Being Mrs. Gentry, I'll still be here blogging about all kinds of random in 2015. If you have any suggestions of blog topics for me to dive into, I'd love to hear them!